With its production site in Bosnia, Anton Paar is contributing to the reconstruction of an area with which there are personal ties. So it was obvious to go to a region that is easily accessible, with good experiences with reference companies and where German is even spoken more often than one might think. The new hall is located in Sijekovac/Brod in an area still marked by the war between 1992 and 1995. Many houses are still destroyed, ruins testify to the sad past. 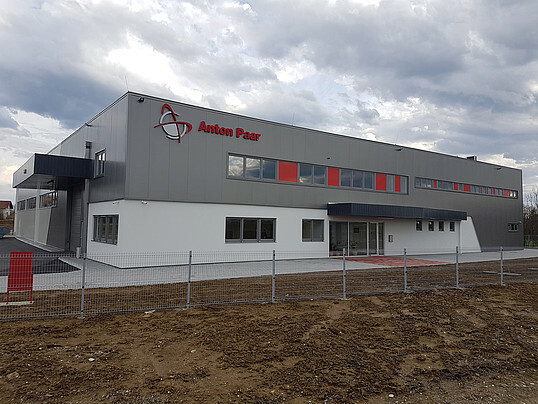 The production hall of Anton Paar ShapeTec Bosnia (APST-BA), which was officially opened on April 13, 2018, is a ray of hope there. The production area of 2000 m2 includes offices, canteen, and ancillary rooms. 35 employees and five interns are employed on site, 13 of them in the CNC area for turning and milling, nine in sheet metal processing and seven in the field of manual work and assembly. The rest takes care of infrastructure, organization, and management. APST-BA is a service company and offers various production technologies. The orders come from Anton Paar ShapeTec in Wundschuh, Austria, from the Anton Paar headquarters in Graz and directly from Bosnia. The employees manufacture turned and milled parts with an accuracy of up to 0.02 mm in batch sizes of 20 to 10,000 pieces, produce edging parts and complete housings including powder coating. "All polyurethane foams for thermal insulation in Anton Paar equipment are now made in Bosnia," says Bernhard Urch, Managing Director of APST-BA. The hall building offers the space reserve that is urgently needed for further growth. Approx. 20 machines and tools are currently in use. Bernhard Urch: "Further expansion steps have already been planned." "We work in two shifts,” says general manager Urch. Because the new hall is about 20 kilometers away from the previous location Derventa, APST-BA has acquired a VW bus, which is now used as a shuttle bus.